We believe in the power and purpose of prayer and that it is a central part of our relationship with God and with His Son, Jesus. The prophet Isaiah declared, " these I will bring to my holy mountain and give them joy in my house of prayer". ​In this way we have embarked on a purposeful journey of prayer and praying, seeking to engage each member of Spirit of Hope in a daily offered conversation with God. To that end, we have constructed a key verse informing God of our interest in His plans for us, that we welcome Him daily into our thoughts and preparation. We declare that we want to be with Him. Make our faith greater than our fears. Grow us in the covering of your love. Surprise has a distinct potential: delight. God’s surprises are delightful to discover, bringing us in full contact with His grace and with His love. Delight IS a blessing, one that is delivered in the midst of a surprise. Surrender yourself to Him. Be surprised. Be delighted. Give thanks. Amen. ​On the first Sunday of every month, we introduce a scripture verse that helps us focus on the business, the art, and the craft of prayer. We encourage you to add this verse to the Surprise us God daily prayer. With each following month, seek out the new verse and add it to the daily prayer. Taken together, they become a spiritual discipline, and we all become stronger in the Lord. Come and see. Taste the Lord, for He is good. 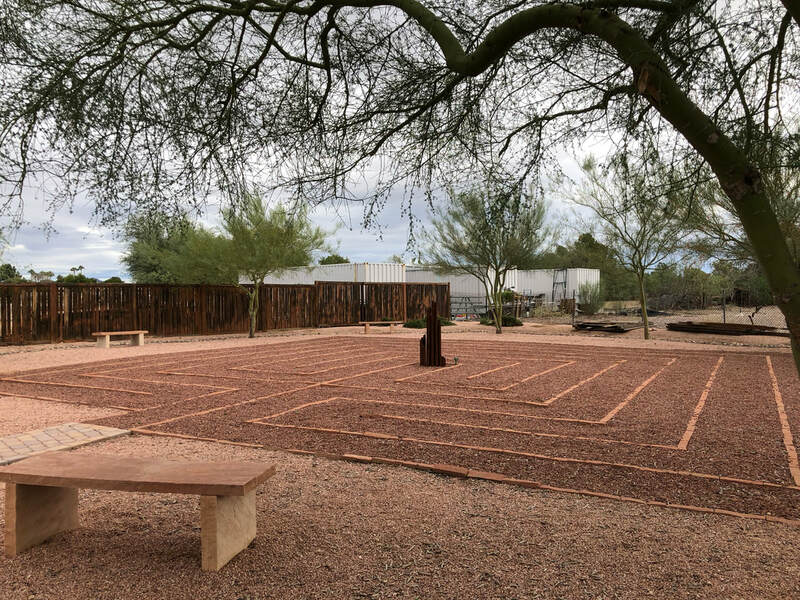 There is a growing practice of spiritual centering being used in Christian circles around the world, and it is called "praying the labyrinth". The practice has a long and ancient history. Christian use of the labyrinth was known early in the cathedrals of Europe where some great churches have labyrinths of stone built into the floors. In modern times a labyrinth might be made of canvas with paint, hedges in a yard, stones in a field, or paper or wood. Some are small and handheld. Here at Spirit of Hope ours is laid out at the edge of a field, as part of a spiritual and reflective garden area. A labyrinth is not a maze. A maze is a puzzle to be solved. A labyrinth is a path that will take the seeker (the one who walks it) in to the center only after the entire path has been taken. You will not get lost on a labyrinth, but you will twist and turn as you find your way to the center of the circle. This journey represents the spiritual life that moves toward the center, then away from the center and finally back again as our lives of faith unfold. A meditative walk toward spiritual center is used to bring the person in prayer to a closer walk with God, and is accompanied all along the route by prayer and supplication, entreating the Lord for clarity, for peace, for grace, and for the inhabitation of the Holy Spirit. 1. Intentionally offer this time up to the Lord. If there is a particular issue weighing on your heart or a direction you feel God leading you, be ready to include this topic in your walk. 2. On the walk inward, you might meditate on a Scripture passage, or talk and listen to God about a particular topic or question. Give you cares and distractions over to Him. God is with you in this walk and in your daily walk with Him. 3. When you arrive in the center, rest and rejoice in the Lord's presence. God longs to be the center of your life. 4. On the walk outward, think about how you will take what God is saying to you back into your daily life. Thank God that He will be with you even after this time of retreat. 5. Process and reflect on your experience in the labyrinth. You may want to write, draw, or share your thoughts with a friend.